In an increasingly off-the-shelf world, Vanity Hall has always been proud to be the exception to the rule. From our humble beginnings in 1992 operating out of a garage, we’ve continued to push for handcrafted excellence at every turn. No corners cut, no shortcuts taken, no minutes counted. Over the years we’ve grown in reputation and workshop space alike, forever adding to our team of highly skilled local craftspeople, some of who have been with the business since the very beginning. 25 years later and that original entrepreneurial spirit and unwavering commitment to traditional English cabinet making and joinery remains evident in every bespoke piece in the Vanity Hall Collection. Each product in the range combines handcrafted excellence with distinctive styling, all of which can be tailored to your every need. Pick from over 50 doors with matching carcasses, before choosing a bespoke painted finish that perfectly captures your personality. We believe in the beauty of effortless, which is why all Vanity Hall units are fully assembled to make installation a breeze. For ease of operation, Blum® soft-close door hinges and intivo glass-sided drawer boxes are fitted on all our furniture, both of which come with a lifetime guarantee. 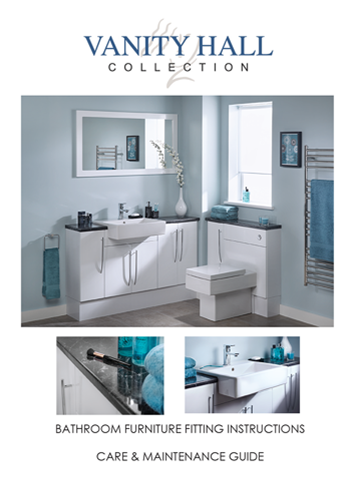 We’re also proud to be a partner of DuPont™ Corian®, who manufacture beautiful bathroom worktops.